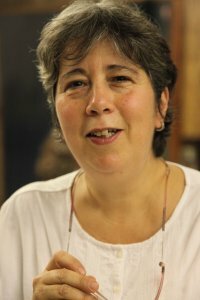 Fatima is a Craniosacral Therapist with almost twenty years experience in the UK and in Italy, having completed her training at the Craniosacral Therapy Educational Trust (CTET) in London in 1999. She is also a tutor with the CTET and is passionate about teaching Craniosacral Therapy to new generations of students both here and in Italy. Fatima also teaches Bio-Dynamic Craniosacral Therapy to Osteopaths in Italy in association with the Associazione Osteopatia Italia. Fatima has been involved in alternative health care since 1983 gaining a diploma in Digital Pressure in Brazil at that time. Subsequently, Fatima trained in Swedish and Oriental Massage and, in 2001, she successfully completed a three-year-training in Medical Chi Kung. She is also a qualified Chi Kung Teacher and ran Chi Kung classes for many years in London and in Italy. Her background also involves experience of working with people with learning disabilities (PWLD) and mental health problems. Fatima has always worked to develop an inclusive practice particularly enjoying her work in Italy with clients with Learning Disabilities and Autism. She has also worked extensively with Mothers and Babies here in London and has a busy practice in North London. Fatima consciously combines her Craniosacral practice with elements of massage and Chi Kung to offer a treatment tailored to each client’s individual needs resulting in a unique treatment that is hugely relaxing during the session while accelerating the body’s healing powers in the days following treatment.